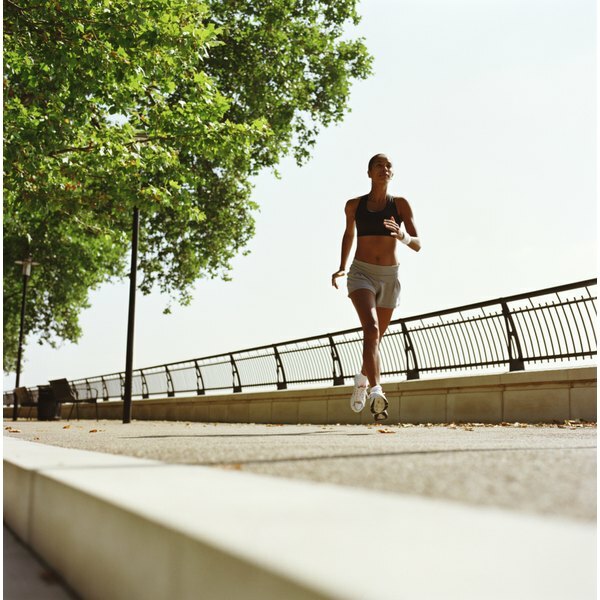 Runners are at risk of several medical conditions besides runner's knee and shin splints. Some experience tingling, or a sensation of pins and needles, in their extremities. If your finger tingles during a run, you may have an underlying medical condition affecting your spine. However, a more common cause is increased blood flow to your legs, which causes tingling in blood-starved regions such as your hands and fingers. If the condition persists, check with a doctor to rule out underlying medical conditions such as Raynaud's disease. During a long run, your body directs blood to the large muscles in your legs. This means that your upper extremities, including your hands and fingers, may suffer from blood loss. As blood concentrates in your legs and feet, you may experience tingling or numbness in your fingers. The blood will return to your extremities as your body returns to its regular state after a run. If the tingling occurs in both hands evenly and disappears after a run, this could be the cause. Raynaud's disease can cause your arteries to narrow and thicken, limiting blood flow and producing tingling in affected areas. The area may also appear pale as blood flow is limited. Cold temperatures, as well as stress, can trigger the onset of symptoms. Smoking and repetitive trauma can aggravate the condition. Iron deficiency, or anemia, can contribute to tingling in the fingers of runners and other athletes. Take an iron supplement if your diet does not include enough iron under federal guidelines. Other dietary supplements that may help enhance blood flow through the body and prevent finger numbness include fish oil and evening primrose oil. Carpal tunnel syndrome, or pressure on the median nerve in your wrist, may cause tingling in your fingers. These pinched nerves occur when too much pressure is placed on the surrounding tissue. Surgery is sometimes needed, but more often rest alleviates the problem. Check with your doctor if the condition persists. A spinal condition such as a cervical herniated disc can cause pain in your arm and tingling in your fingers. This condition, which results from a bulging disc in your spine, usually affects people between ages 30 and 50. If the tingling in your fingers is accompanied by pain in your arm or muscle weakness, you may have a herniated disc. Prescribed medication can often control the symptoms. Make an appointment with your doctor to determine the cause. National Heart, Lung, and Blood Institute: What Are the Signs and Symptoms of Raynaud's?